Following the above quote, the Student Social Responsibility (SSR) Committee organized the annual social flagship event of SIMSREE i.e. 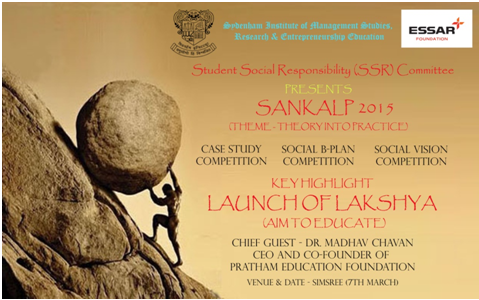 Sankalp on 7th March 2015. The theme Sankalp’15 was ‘Theory into Practice’, which means not just giving ideas, but carrying out necessary actions to implement them. The theme highlights how each individual can make a huge impact in bringing out a positive change in the society. 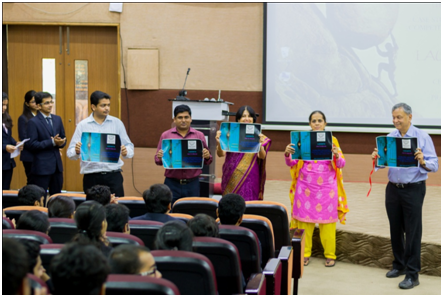 In line with the theme, the SSR committee came up with an initiative ‘LAKSHYA- aim to educate’. ‘ LAKSHYA’ is an initiative wherein the students of SIMSREE will be actively involved in educating the children of a local BMC school, with the ‘Lakshya’ of enabling them to not only clear 10th grade, but also develop a strong foundation for the bright and promising future that awaits them. This will be implemented from July 2015 at SIMSREE. 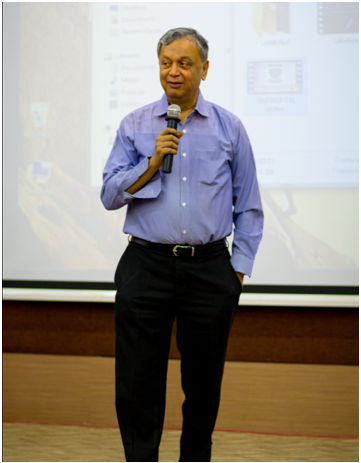 The Chief Guest for the event was Dr. Madhav Chavan, CEO and Co-founder of Pratham Education Foundation. He is also a former Member of the National Advisory Council of India and member of the governing council of Sarva Shiksha Abhiyan Mission (SSA) of the Government of India. The event started with an address by our Director Dr. Sandhya Dhabe introducing the theme of the event and emphasizing its importance. Our HOD Finance, Prof. Sangeeta Pandit, explained the students the importance of being involved in social activities. This was then followed by an inspiring speech by our chief guest focusing on the need and methodology of educating young kids. His emphasis was on motivating the kids to learn, rather than focusing on how to teach them i.e. do not teach them concepts, but increase the curiosity in them so that they will learn even when you are not there. This will also help the mentors learn a lot in the due course. He urged the students to actively volunteer in this initiative. Also, it was very kind of him to extend his support for the implementation of ‘Lakshya’. 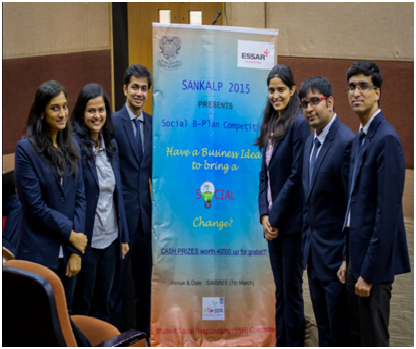 After the initial inauguration, we moved to the final rounds of the competitions held during Sankalp’15. 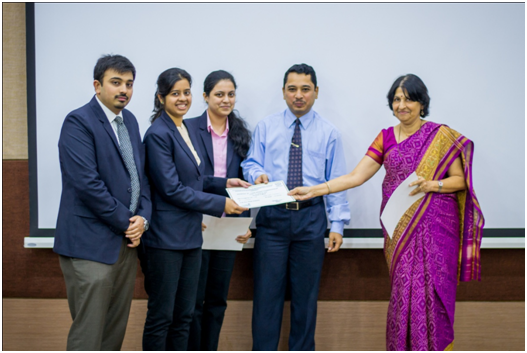 SSR committee along with ESSAR FOUNDATION organized the social b-plan competition, which saw the highest participation among all competitions. 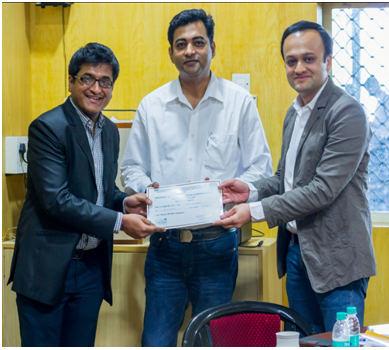 Top 5 teams were chosen for the final round, which was judged by Mr. Neerav Parekh (Director, Iksula) and Mr. Nilesh Halde (Director, AppLions Pvt. Ltd). The teams presented their ideas of a socially motivated profitable business plan, with top 2 teams being declared as the winners. The case study was judged by our HOD Finance, Prof. Sangeeta Pandit and Dr. Arvind Dhond (President and Treasurer of all India Teachers Association), where top 6 teams presented their solution. The ideas and enthusiasm of the participants in each of the competitions, the involvement of the jury and the support of ESSAR FOUNDATION significantly raised the standard of the event. We would also like to thank the students of SIMSREE for their active involvement in the initiatives and events by SSR committee.